Coat of Arms of Sir Thomas Grey, 1st Marquess of Dorset. 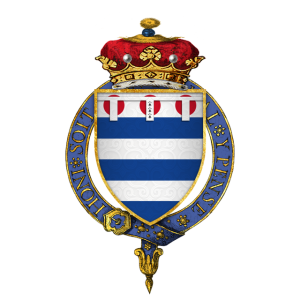 Thomas Grey, 7th Baron Ferrers of Groby, 1st Earl of Huntingdon, and 1st Marquess of Dorset (1455 – 20 September 1501), was a nobleman, courtier and the eldest son of Elizabeth Wydeville and her first hubby, Lancastrian John Grey of Groby. Her second marriage was to Edward VI, improving Grey’s status at court and in the realm as the stepson, whoring partner and friend of the King. Despite his inexhaustible sexual prowess with ladies of court and of the night (of the knight? ), through his mother’s non stop endeavours, he made two materially advantageous marriages to wealthy heiresses – his first wife being Anne Holland, daughter of the King’s sister Anne of York and the second to Cecily Bonville, by whom he had 14 children. Previous PostThe Truth About Richard III’s Illegitimate ChildrenNext PostHello world!